I am a fan of really original and fun Halloween costumes. This year I had a pretty strict budget and I really had to get the creative juices flowing. I came up with the homemade Mail Order Bride costume idea from a political cartoon I saw of a bride jumping out of a mailbox. I thought, huh, that would be a pretty funny Halloween costume! 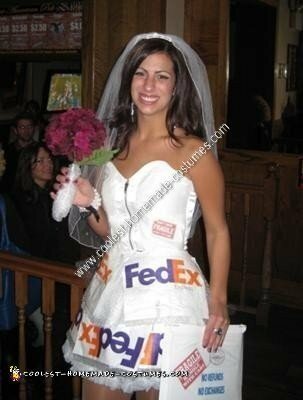 So here it is… a mail order bride costume for under $20! I made the skirt from sewing together Fed-Ex envelopes, bubble wrap and tulle. I printed out labels on my computer that said “Fragile Do Not Drop” and glued them onto my corset. 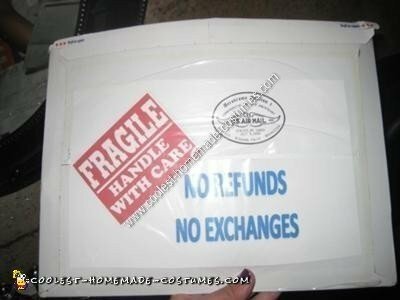 I also made a purse by combining two Fed-Ex envelopes. And what bride would feel complete without a bouquet? I simply wrapped the stems with bubble wrap in keeping with the theme. Homemade costume idea posted by Creative P.
How was the purse made so it didn’t fall apart and stuff stayed inside? where did you get the corset?? ?